Our culture has a complicated emotional and conceptual relationship with bones. They are relics of lost heroes, remains of loved ones, and symbols of fear, death, and the unknown. This work presents three contrasting perspectives of this relationship in three movements. Each movement uses different processes of electronically manipulating the voice of the baritone and the prerecorded sound of a lamb’s bones being butchered with a hacksaw. 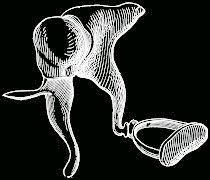 The text from each movement is the name of an ossicle, one of the tiny bones in our ears commonly known as the stirrup, hammer, and anvil. These words themselves are not intended to tell a story or convey a particular meaning apart from being the bones most fundamentally tied to our perception of music. Instead, these words are treated as topically related material for syllabic deconstruction within each movement. The first movement, entitled “The Shore of the River Styx” conveys the mystery and timelessness contained in our reaction to mythology. The river Styx is present in several mythological stories, from the story of Orpheus to The Divine Comedy, and often represents either a portion of the underworld itself, or a boundary between the mortal world and the underworld. Charon, the boatman on the river Styx, is often portrayed in artwork as an animated skeleton. In this movement, the baritone hauntingly sings the word malleus, and is processed through reverb and delay, while the sound of bones being sawed is manipulated to mimic the sound of water lapping on a shore. The second movement, entitled “To Die, to Sleep – No More,” draws inspiration from Hamlet’s soliloquy over the bones of Yorik. In this famous monologue, Hamlet initially suggests that death is merely eternal rest, and, as such, is nothing of which to be afraid. However, Hamlet goes on to suggest that, fundamentally, death is an unknown, and is therefore terrifying to us. As such, the voice part in the second movement begins as a peaceful, chant-like mantra on the word “incus,” but gradually becomes more and more unnerved as the baritone improvises material that becomes increasingly dissonant. The voice part is treated again with reverb, and with distortion that gradually becomes more and more evident as the movement progresses. Beneath this, a shifting drone is played which is created using the sound of bones being sawed as a complex waveform for a synthesizer. The third and final movement, “Sacrificial Dance,” draws its title from the final movement of Stravinsky’s The Rite of Spring in which a young girl is forced to dance herself to death. This movement presents the physical brutality and horror that often accompany death. Electric saws cutting through cow bones, as well as percussive sounds created from the sound of bones being sawed, accompany the baritone, who has assumed the role of sacrificial executioner. His voice is recorded and played back as he systematically builds the word “stapes” from its constituent syllables. The resulting cacophony culminates, and closes the work.